“Arcane Barrier” does not gain Spell Counters when face-down Spellcasters are destroyed, because a face-down monster is destroyed before you can confirm its Type. Sending “Arcane Barrier” and a Spellcaster to the Graveyard is a cost. 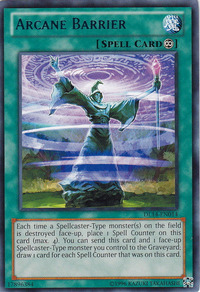 If multiple Spellcaster-Type monsters are destroyed simultaneously, this card only gains one Spell Counter. Sending this card and a Spellcaster-Type monster you control to the Graveyard is a cost to activate the drawing effect. 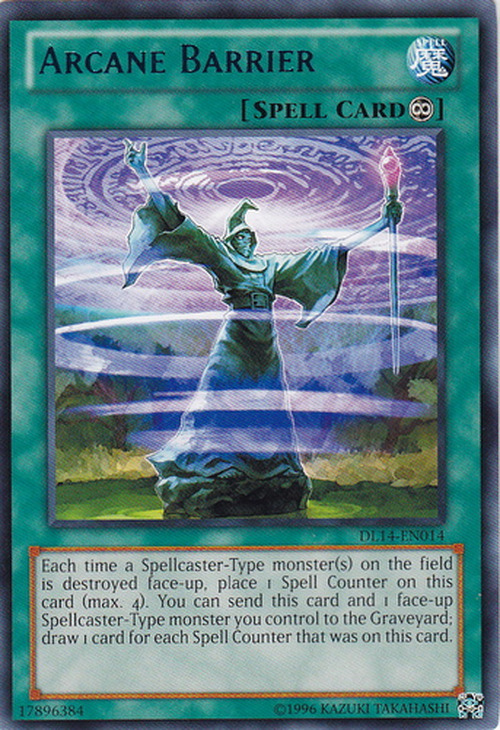 If a face-down Spellcaster-Type monster is destroyed, this card does not gain a Spell Counter. : When a face-down Spellcaster-Type monster is destroyed, can a Spell Counter be put on "Arcane Barrier"? When the effect of "Imperial Order"/"Spell Canceller"/etc negates the effect of "Arcane Barrier"/"Magical Citadel of Endymion"/etc while the latter has Spell Counters on it, all Spell Counters are removed from "Magical Citadel of Endymion"/etc. : When the effect of "Magical Citadel of Endymion" is negated, are all Spell Counters on it removed?